Want to get into the styling outfit of action like The Bond? Waste no further time and check out the collection of James Bond Suits and James Bond Tuxedos. You know it and believe, that all of them you see are the right look alike from the movies, and now they are made available to you at the best selling price. You can grab the Daniel Craig Tuxedo, Casino Royale Suit and much more that are visible here. Follow the size chart, and you will get yourself the best fitting attires ever. Neat stitching is done throughout, capable of being sustainable. So hurry now and go for it. Choose your favorite James Bond Tuxedo from the collection of suits and place your order. Spectre is a movie from the James Bond series that started in the year 1962 and had been successful since then. The movies tend to make a profound effect on the viewers, and they are attracted to the character due to Bonds wears and smart gadgets. The film Spectre was a huge blockbuster and made a fortune in the movie industry. The success was not only because of the performance of Daniel Craig but also because of the various James Bond outfits and tuxedos he can be seen in. Let’s have a look at some of the James Bond tuxedos and suits that can be viewed in the movies. He has a sensational personality, and for that reason, he requires attire that is of his standard. Every movie has a different suit and tuxedo combination that allows him to move with elegance and decency. 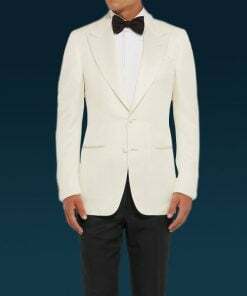 Daniel Craig wore an Ivory tuxedo in the movie “Spectre.” The James Bond white dinner jacket has a stylish wide peak lapel collar that looks astonishing with the two button front closure. Viscose lining is stitched in order to absorb all the sweat and keep the person fresh. The jetted pockets along with four button cuffs make this attire commendable and boost the personality to unprecedented levels. 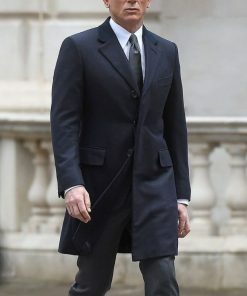 Daniel Craig has played a role in the movie “Spectre.” He has a bold and muscular personality that allows him to wear excellent quality attires which are tailor-made especially for him. He can be seen dressed in a three piece suit which has a standard notch lapel collar that goes down to a two-button front closure. Along with the coat, its six button vest gives the appearance an overwhelming boost. Celebrity attire is always tailor-made to distinguish it from other fashions due to the necessity to grab the attention of plenty of viewers. It is a character that people of all ages around the world watch, so it is necessary for him to be well dressed in front of the viewers. 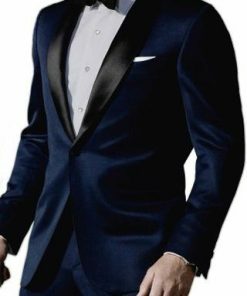 This Spectre James Bond navy blue attire is made of an excellent quality material and shows conventional fashion. It has a wide peak lapel collar with two buttons front closure. The light, slim lining design is all that makes it so elegant. He has made several appearances with different kinds of apparel in the movie Spectre. Another type of James Bond film outfit that he can be seen wearing is the blue double-breasted suit. The double-breasted has its own classic style fashion. This has a standard peaked lapels collar which looks decent and a double button front closure which makes it easy for any person to get it on. Classic flap pockets match perfectly with the vintage fashion of the coat. Charcoal grey is a color that can blend in with almost every kind of theme. You can wear these tuxes and suits of James Bond made of that color for weddings, and also for formal meetings. Some of the hotels have dress codes, and you can wear this decent looking charcoal grey suit for it. This James Bond grey suit has a narrow notch lapel collar and jetted flap pockets that look stunning with the two button front closure. The welt pocket is also crafted a bit tilted to show stylish fashion. Herringbone is a cloth that is weaved in a V-shape pattern. The fabric is used in making that are to be worn on special occasions and are found to be warmer than other attire. Since the Daniel Craig James Bond Suit need to be distinct from each other and display good fashion, so this is best to depict a sober personality. Another outfit that we can see in the movie is the blue Herringbone suit. The coat has an impressive wide peak lapel collar with a two button front closure. In addition to the external flap pockets, this James Bond Daniel Craig suit coat has a ticket pocket crafted above the right flap pocket. The vest is made with a design in resemblance with the coat and has a five button front closure with pointed bottoms. Brown is a decent color that can be worn for both formal and informal gatherings and meetings. It is made of brown color have the quality to blend in with almost every kind of theme; may it be a party or a wedding ceremony. Celebrities also take advantage of such high-class attire and make an appearance with them on the big screen. Daniel Craig has worn a brown two piece in the movie “Spectre.” This James Bond Suit has a coat with a plain format. The collar is a standard notch lapel with a two button front closure. Flap pockets crafted on the front gives this vintage style. 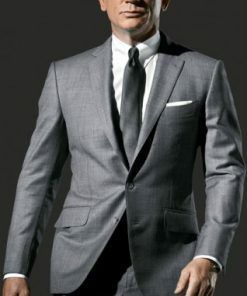 The trouser with this Daniel Craig suit is in a straight style and consists of two side pockets and two back pockets. Casino Royale is also one of the movies that hit the Hollywood industry in the year 2006. The movie was a great blockbuster, and the apparel of Daniel Craig along with other characters was astonishing. He can be seen wearing various kinds of attires in the movie. One of them is the blue three-piece suit that has a pinstripe lining pattern all over it.